This image, taken just south of U.S. 34 and 83rd Avenue, shows hail accumulating on the ground. 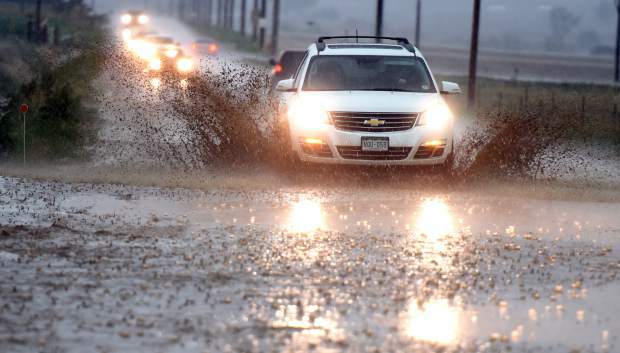 Hail and heavy rain on Monday led to areas of flash flooding in Greeley. Cars drive through the muddy water that has spilled onto the roads on 83rd Avenue in west Greeley. Cars drive through the water at the intersection of 11th Avenue and 10th Street in downtown Greeley. Cars struggle through some of the deeper water at the intersection of 10th Street and 11th Avenue on Monday in downtown Greeley. A city worker tries to grab the caution barrels and cones that are floating away as rain continues to fall and roads flood on Monday in downtown Greeley. 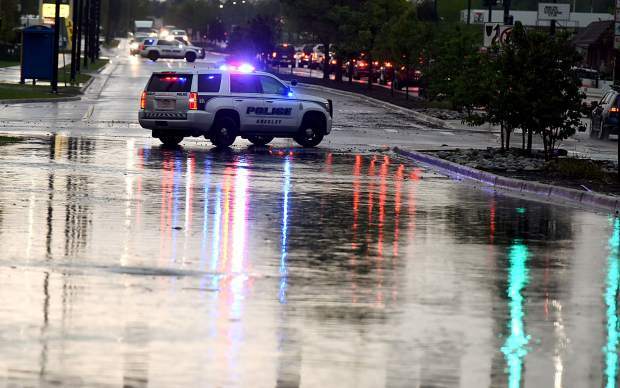 About 1.5 inches of rain fell in Greeley Monday during a 20-minute period, causing widespread flash flooding. 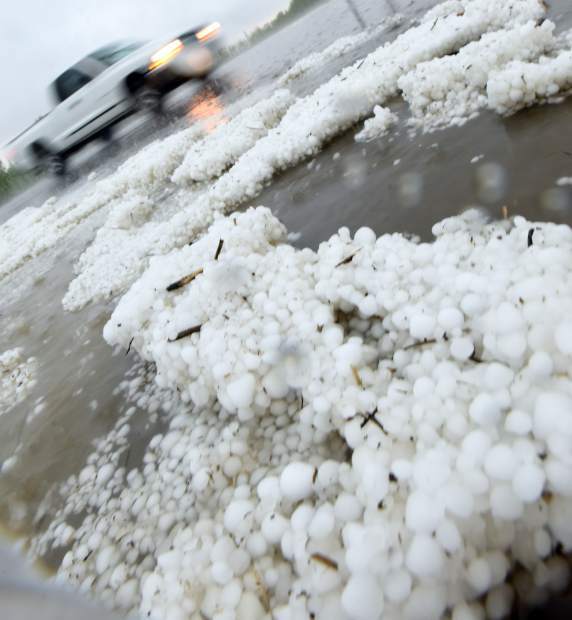 Piles of hail line the roadside in west Greeley after a storm swept through the area Monday afternoon. A police car blocks traffic in front of some of the high water that snarled traffic on 10th Street on Monday in Greeley. » Greeley — 1.5 inches. » Windsor — 0.24 inches. 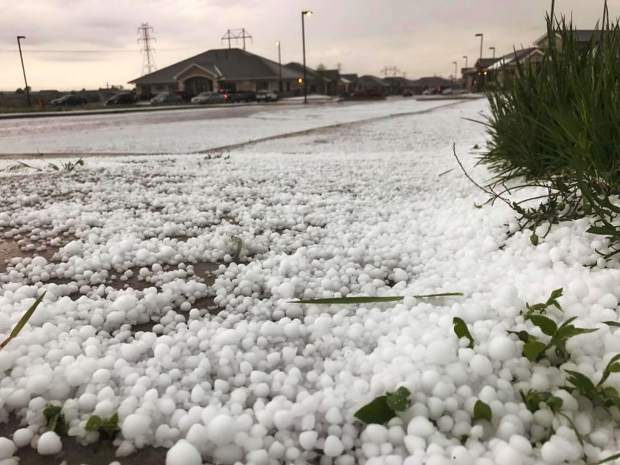 A quick-moving thunderstorm welcomed Weld County into the spring storm season, flooding areas of Greeley, Evans and Garden City, and dropping pea- to marble-sized hail on vast swaths of the county. Residents were first officially warned of the storm at about noon, when the National Weather Service issued a severe thunderstorm watch. That announcement came with warnings of large hail, high winds and the outside chance of an isolated tornado. Rain and hail began coming down about 3:30 p.m. in west Greeley and moved east fairly quickly. Despite the onslaught, and the timing — around rush hour — Greeley Police Lt. David Spies said there were no traffic crashes as of about 5 p.m.
National Weather Service said spotters reported up to 1.5 inches of rain in a 20-minute period, which combined with hail-clogged drains to cause flooding throughout Greeley that reached 2-3 feet near U.S. 34 and U.S. 85. Greeley Fire Department spokeswoman Teresa Hinz said firefighters received 30 calls of flooding in about two hours. She said firefighters helped several residents get out of garden level apartments that had flooded. One was at 1315 3rd Ave., where residents in two apartments rush in at waist height. At 1314 9th St., firefighters rescued residents from about 4 feet of water. Several businesses and buildings also suffered flooding damage, including Greeley City Hall, 1000 10th St., and an apartment complex in Evans. Sears Real Estate, 2021 Clubhouse Drive, also was reportedly flooded during the storm. 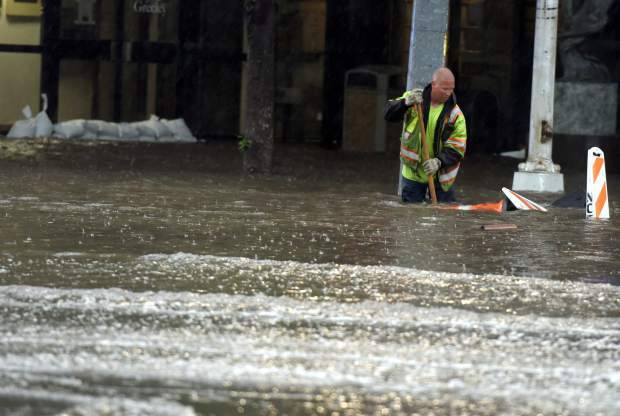 Springfield and co-workers were bailing water out of the office Monday evening after the storm, and Springfield said she was anxious more rain could be on the way. The Greeley Mall suffered damage, too, as a video posted on a popular Greeley Facebook page showed water pouring into the mall from the roof and debris coming down to the mall floor. 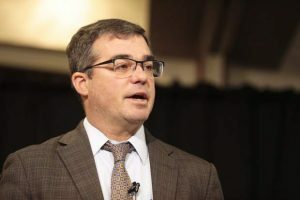 Hinz said firefighters were called to the mall, but she didn’t have any details about what had happened because the report hadn’t been filed late Monday. The Frontier Academy Elementary School, 2560 29th St., flooded, forcing teachers to stay late to try to clear the water. Administrators canceled classes Tuesday for Frontier elementary students. They planned to reopen the school Wednesday. Delia Jimenez, who lives two blocks from Salida del Sol, 111 East 26th St., said her neighborhood also suffered bad flooding. “Part of the park is flooded, whole streets — you can’t even drive through here,” Jimenez said. 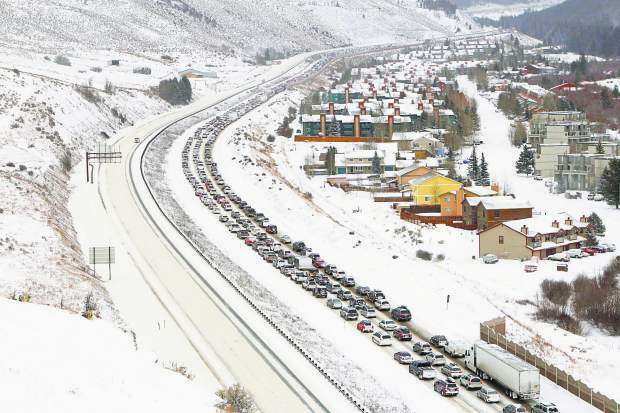 The National Weather Service said, despite the small amounts of precipitation, the rain fell in a short time period, and hail blocked drainage systems, causing flooding. By 2:50 p.m., the National Weather service upgraded its thunderstorm watch to a severe thunderstorm warning, and by 4:15 p.m. had included several Weld County communities, including Greeley, Windsor, Evans, Eaton, LaSalle and Kersey. Windsor-Severance Fire Protection District had multiple reports of lightning strikes, including one that hit near Windsor Middle School, 900 Main St. in Windsor, and set off the school’s fire alarms, something Chief Herb Brady said was relatively common. 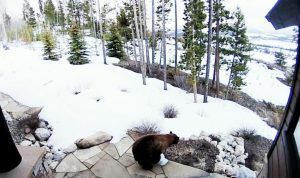 “The real killer weather-wise is lightning and flash flooding in Colorado,” Brady said. 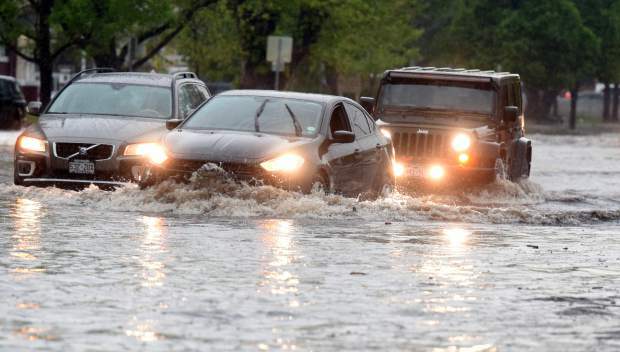 In Greeley, that advice wasn’t always heeded, as motorists encountered — and drove through — high water at numerous intersections throughout the city. 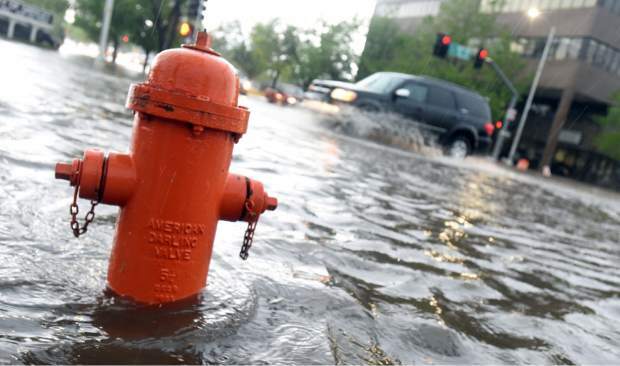 There were reports of flooding at 20th Street and 59th Avenue, 10th Street and 83rd Avenue and 22nd Street and 35th Avenue, among numerous others. Near the Boys and Girls Clubs, 2400 1st Ave., the water was high enough some residents used a boat to make their way down 24th Street. Storms peppered the entire Front Range with hail, but Weld County was mostly spared large hail. The largest reported hail in Weld was 1-inch hail southwest of Greeley. Meanwhile, Wheat Ridge had reports of 2.75-inch hail — slightly smaller than a baseball. Car windshields were smashed throughout the area. “You gotta assume there’s gonna be a lot (of damage),” National Weather Service meteorologist Kyle Fredin said of the Wheat Ridge hail. Storms caused the evacuation of Colorado Mills Mall in Lakewood, as the building was severely damaged by hail and flooding. 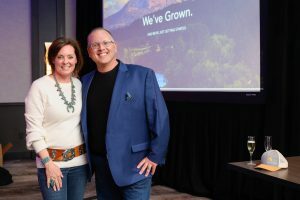 — Emily Wenger contributed to this report from Windsor. Paul Berry contributed from Evans. The Associated Press contributed from Denver.